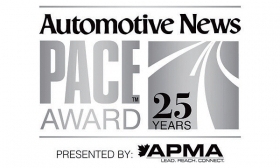 Suppliers have until Sept. 5 to apply for the 2019 Automotive News PACE Awards, which identify and honor game-changing and commercialized innovations in technology and processes. The Automotive Parts Manufacturers' Association is the exclusive sponsor. Information and applications are available at autonews.com/pace. The PACE Awards rely on independent judges to select a field of supplier finalists, which are then visited by judge teams to review the innovations and their competitive impacts. Interviews with key customers are also part of the evaluation. PACE judges are looking for great global entries, says J Ferron, PACE director of judging. Entries are expected to include automotive product and key process innovations from traditional and new suppliers. "In 25 years the PACE Awards have become the global celebration of those automotive supplier innovations that altered the traditional competitive landscape in both products and processes," Ferron says. "PACE awards over the years have defined the cutting edge of transportation innovations commercialized for the benefit of customers, consumers and society in general." Winners will be announced April 8 at the Max M. and Marjorie S. Fisher Music Center in Detroit.